Welcome back, dear reader. I hope you had a happy holiday and wish you a fruitful New Year. 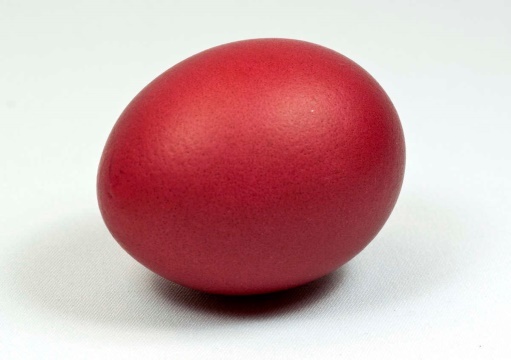 In a few months’ time it will be Easter and some of our Greek friends will be celebrating with eggs coloured deep red like this one. Well, some of the first flight data recorders were made by a British firm S. Duvall & Son and they were indeed spherical. Known in the trade as the “Red Egg” recorders, their design was derived from the original prototype developed by Dr Warren from the Aeronautical Research Laboratory in Australia. These devices recorded signals onto steel wire which could then be replayed in the same way as the more familiar magnetic tape. If you want to see what one of these recorders look like, go here. The earliest recorders had a single length of wire, recording data for 300 hours before it had to be replaced. It is not surprising that the second version which followed had a loop of tape which overwrote old data after 25 hours. In these designs the signal to the recorder needed no alteration, so this unit held only the mechanical components of the wire recorder inside the case you see. The recorder was spherical for strength, and weighed 15lbs. New recorders, such as Curtiss-Wright’s Fortress cockpit image, voice and flight data recorder, still use the strength of curved material to protect the information, using a tube rather than a sphere for strength. The tube is made of titanium and designed by computer to ensure that the mandatory strength requirements are met at the lowest possible weight. Because the size of the storage media (now flash memory) has reduced, the protective tube is hidden within the unit which houses the electronics needed to prepare the information and manage the storage media. 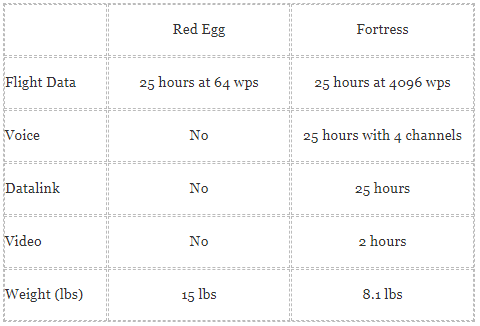 Here is a comparison of the two recorders. It is interesting to see that the duration requirement has not changed but the volume and range of types of information that can be recorded has grown enormously, while the weight has about halved over the years. The ease of accessing the data has also changed. An old recorder had to be removed from the aircraft, disassembled and the wire put on a replay machine whereas now the data can be downloaded to a computer in seconds.